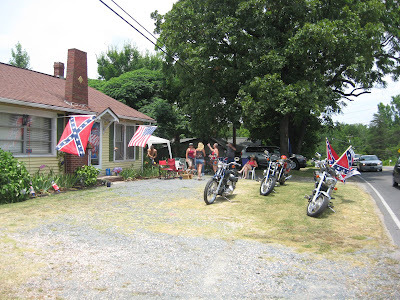 Faith, NC has a yearly 4th of July festival, and the entire town gets in the spirit. 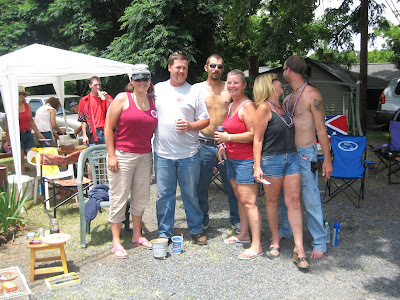 When ride through to the festival or to visit friends, you'll see lots of patriotic decorations and lots of cook outs. I stopped by this one which was at full tilt when we were leaving the festival. They thought I was an old buddy but couldn't place my name (-: So, I had to confess that I was a blogger and wanted to see if I could chat and take a few photos. 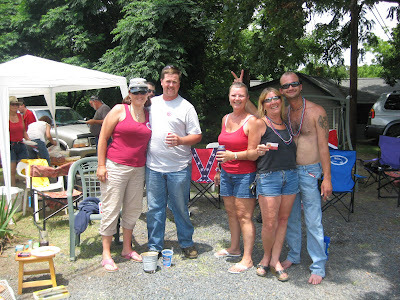 The blonde lady lives right on Main Street in Faith, so she is the yearly cook out host. She does all the set up and provides the place to party, and everyone else brings the food. The guys do the grilling. Now, that's the way to do a cook out with everyone pitching in. It looked like they were grilling hot dogs and hamburgers when I was visiting, and you can never go wrong with those. Yum! I also gave them one of my Yes You Can Grill cards, so maybe next year they'll try out some Grill Girl ideas too. The guys were getting the truck on down the road from the parking lot, so I had to say good bye to these friendly Faith, NC grillers. I'll look for them again next year and give a wave and see if they remember me.